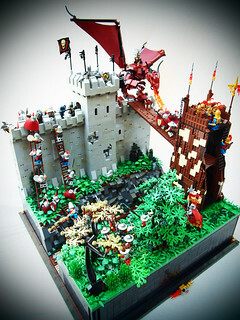 Classic-Castle.com • View topic - (LCC GC3 Part 2) The Siege of Lost Souls. (LCC GC3 Part 2) The Siege of Lost Souls. More pictures and the Story can be found on Flickr. Last edited by Mark of Falworth on Sun Feb 03, 2013 11:40 pm, edited 1 time in total. Re: (LCC GC3 Part 1) The Siege of Lost Souls. This, this is done to perfection. The level of detail you've created is insane. Those rocks are awesome. Incredible work, Mark! Superb! Amazing ob on the build as well as the lighting! Humph... good job again Mark. That's some pretty cool rock work, foliage and castle you got packed in there. Very nice. Re: (LCC GC3 Part 2) The Siege of Lost Souls. If it were up to me, this would get blogged on TBB. Really amazing job, particularly with the damage to the wall. It looks really realistic. Yes, this build managed to capture the chaotic feel perfectly. I in particular though, don't prefer the editing. I wish there was a nice, clean, picture to look at. Anyways, some of my favorite details are the rubble inside the castle wall, and the ravine is pretty cool too. 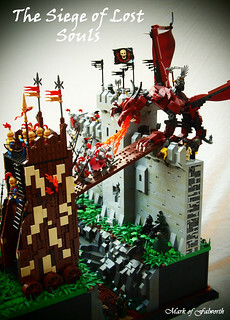 As said on flickr, this is totally awesomeness and EPIC. This the real "Epic dragon battle" set, this is how it should look. Incredible siege scene, the smashes parts of the wall and filler that can be seen on the end are incredible.